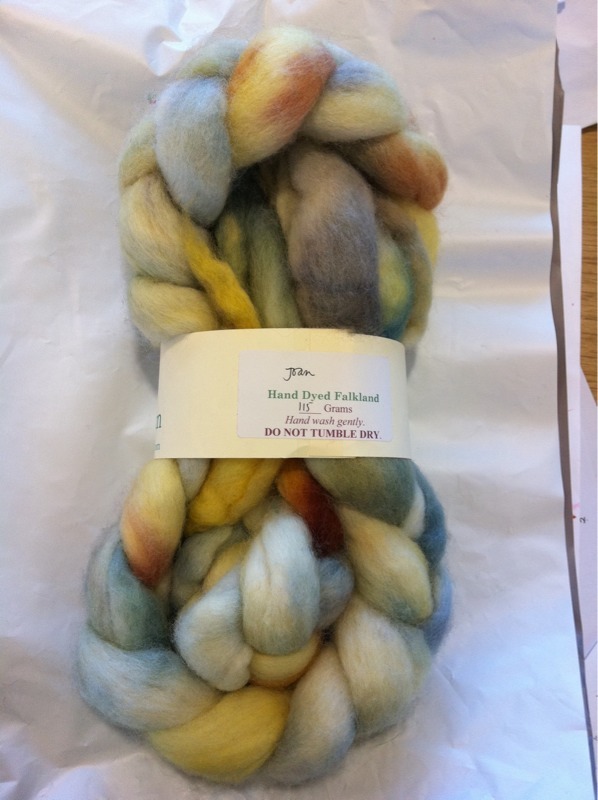 A spinning FO for you this time, which people on the Irish Spinners group have already seen. It’s my February skein in the Skein-a-month Spin-a-long that I only finished the other day. It’s impossible to capture the colours properly, though I did make several attempts. It’s looking very blue in these shots whereas there’s a lot of green in reality. I’m calling it Kingfisher Blues because it has those blues and greens. Plus it gave me the blues! I started spinning this (on my Ashfird Student spindle) last Summer as part if the Tour de France; and made a haimes of it by not drafting the fibres out at all. I undid that, before I went too far and started againg on the spindle. 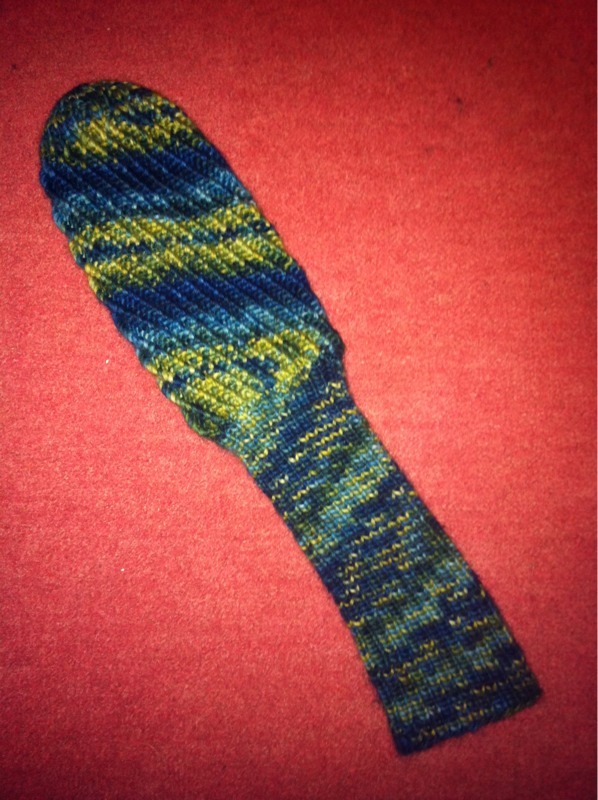 I got on much better the second time around but then got distracted by other projects… and probably my wheel too. I took it up again in early February and spun the other ball of Louet Top on the wheel. I continued spindling the first ball of top but was finding it very slow. In an attempt to be finished by the end of February, I spooled it onto a bobbin and spun the rest of it – that was a fun excercise! I learned a lot while making this skein. I had a lot of breaks, both while spinning and while plying. My spinning ability improved, especially my spindling. I “made a break for it” and tried spindling without park & draft. But I don’t like the feel of the finished yarn and I’m blaming the fibre I started with. I don’t think I’ll get Louet top again. However, I *am* going to knit with this – and possibly very soon. I think I’ll make another golf-club cover for my mum. The colours are perfect and it should last a bit better than the Malabrigo one I just gave her. Yet again the last day of the month falls on a blog-post day. Uncanny how that keeps happening. For the first time this year I have something to report in the FOs section – two things in fact! One of them I can’t show you – I’m such a tease – but I know you’ll still be delighted. I finished the Cardigan / Jacket that I had long-promised for my DD. More than that, I wrote the actual pattern AND sent it off to Knitty. I know, I’m gob-smacked too! This is the reason why you can’t get even so much as a peeksies. I will, of course, let you know whether I get the thumbs-up from the powers / Gods at Knittydotcom. The other FO was the super-fast and satisfying Whimsie golf-club cover in fantabulous Malabrigo. I just love how the striping emerged in the finished item. This was a great knit and very well received by my golfing-mad Mum. It only took a few days and is very portable. I may make more for her. GlenvArgh! is still untouched and is likely to remain that way for the foreseeable future. Meanwhile Petals Wrap has been languishing while I was focussed on the pattern-writing. I managed to resolve the mistake I has made without ripping. A neat trick I un-vented that is worthy of a guided-tour blog-post in the future. I haven’t started the Peaseblossom Tunic by Kirstin Omdahl in Fyberspates Lace yet. I’m was planning on bringing it with me as my in-flight crafting entertainment when I fly to Berlin tomorrow. Though @CathyQTpi made a very good point in my last post so I’ve decided to stick with Petals and resist the shiny-shiny. After all, Petals *is* crochet too so is also acceptable when flying. Only a month later than intended, I finally finished my February skein for our skein-a-month spin-along. I’ve only measured the length (purely for the purposes of this post) so it hasn’t been washed, thwacked or measured for WPI yet. It certainly hasn’t been photographed in all it’s daylight glory. So you’ll have to be patient for a future blog-post to see the finished skein. 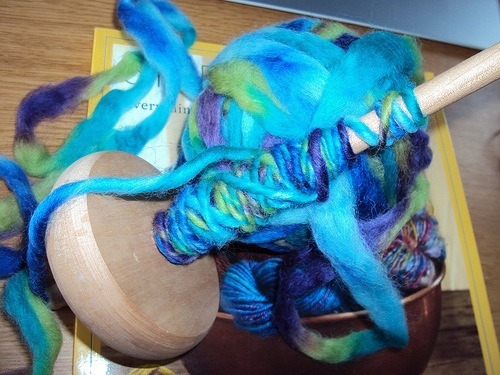 I didn’t enjoy the yarn as I was spinning it – though I enjoyed spinning the yarn… if you follow me. Let me explain: I enjoyed the process of spinning but I was disappointed with the product. The corriadale seemed rough and hairy. 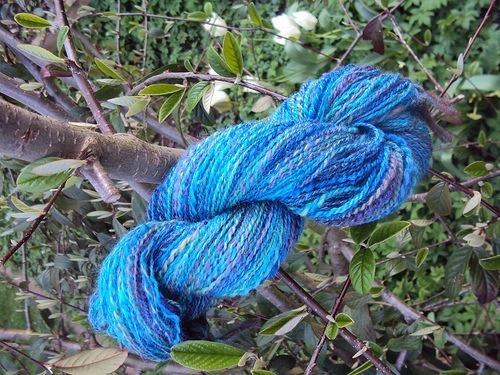 I was pleasantly surprised by how squishy it all turned out after I plied it. There are several mistakes, breaks and knotted joins throughout this skein. It will be “fun” again when I knit it up. It’s like I’m giving a present to my future self! 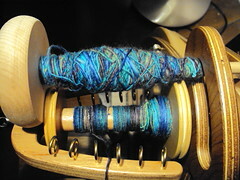 One bobbin finished sooner than the other as I was spinning so I toyed with the idea of learning to Navajo-ply it. And I will… but for now I’m adopting BionicLaura’s approach of storing the remaining single on a toilet-roll insert. She is my spinning guru, afterall so who am I to venture off into the unknown. 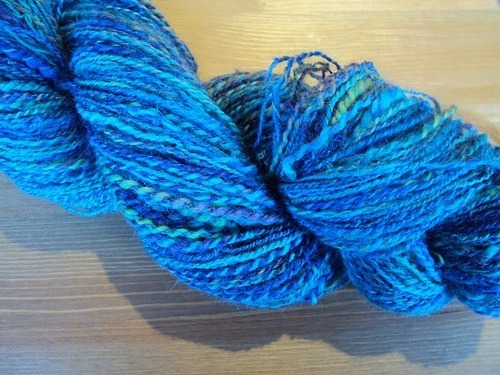 It’s a skein of Falkland, hand-dyed by Laura Hogan that was hand-picked for me by KneeHigh in This Is Knit. I had a little splurge for my big-number birthday – which I cunningly avoided mentioning in my February round-up. The colourway is called “Joan” and I didn’t see it before it arrived – I trusted KneeHigh’s judgement entirely. And wasn’t I so right to do so? Great colourway that i might not have even noticed in the shop if I’d been left to my own devices. It was such a treat to unwrap a surprise parcel I’d managed to buy myself! Another bit of USA arrived unexpectedly from FourBoys, aka @Doogarry. 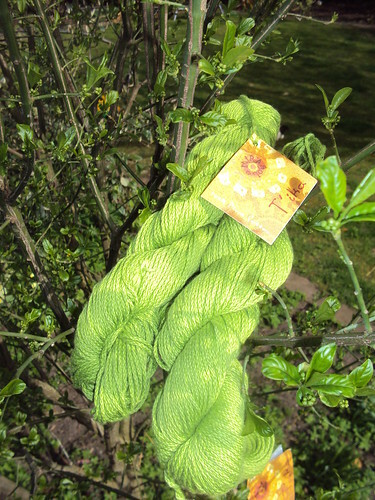 Three skeins of T’ika by Mirasol in a beautiful Spring-y green. She sent it to me as a present for my (big number) birthday so I’m calling it “Spring Chicken” coz I ain’t! The sentiment she wrote in the card was so lovely I keep it on my desk to cheer me up. It’s so nice when people let you know that they think fondly of you; and so important to remind yourself that there are people who do. Yarn balance c/f = -415m i.e. I used up more than I gained!